Jia Jang talks about how his experiences when he was 6 years old influenced how he started his company and live a more . Through a 100 days of Rejection Therapy, he learned how to handle being turned down by other people and having to ask the right questions. For a 100 days, he went out of his way, to get rejected by someone, sometimes successfully, and other times not so much. As recruiters, we face rejection daily, often more frequently than we would like to. Learning how to handle them is a pivotal part of the trade and facing new challenges every day might just be the right place to start at. If you would like to know more about Jia Jangs’s journey, you can read about it on his website. On a similar note, rockstar and former living statue Amanda Palmer talks about her time as a street artist. As she grew as an artist, she learned how to rely more and more on her fans and strangers whilst on tour, just as recruiters need to rely on people barely known on a day to day basis. You can read more about her journeys in her memoir, ‘The Art of Asking’, where she further dwells into the importance of sincerity and compassion. Jason Fried has a theory about work: namely that it doesn’t happen at the workplace. He suggests that the two biggest enemies of work, namely Managers and Meetings (M&Ms) stop you from getting actual work done. They side-track you from real, uninterrupted work time and offers three possible solutions to get you back on track. Wingham Rowan explores the idea, that those people, who might not have the availability to work 9 to 5 jobs are just as hireable. Some employers could even take advantage of people at their fingertips and markets connecting these employers to candidates who cannot take on full time jobs are the next platforms for recruiters to look out for. 5. Regina Hartley – Why the best hire might not have the perfect resume. Regina Hartley, Vice President of Human Resources at the UPS Information Services Division knows a thing or two about the different paths people take to get where they want to be. Some go through Ivy league schools, prestigious internships and find success in the business world. Others find themselves washing dishes and working long hours, to support their studies or their families, and try to get by through hopping jobs. In her talk, Hartley argues these are the people you should consider interviewing. Listen to her, to find out why! 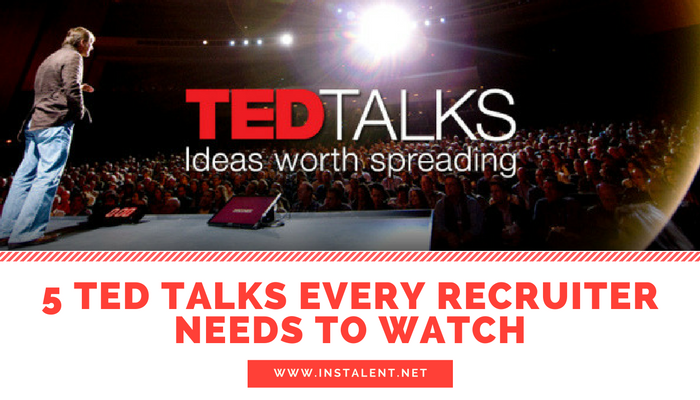 Have you seen any interesting Ted Talks related to recruitment? Let us know in the comments!